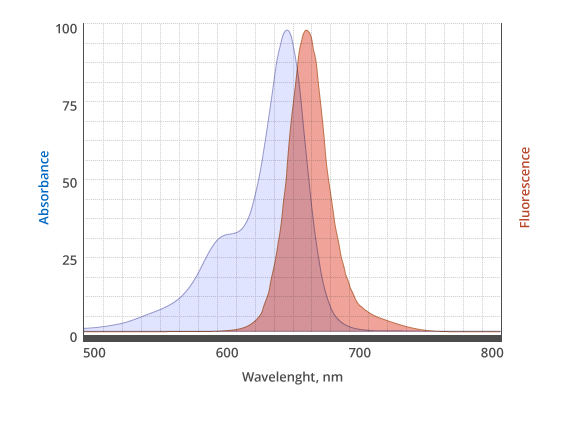 IR 650 Picolyl Azide (IRDye® 650 Azide analog) is an advanced fluorescent probe that incorporates a copper-chelating motif to raise the effective concentration of Cu(I) at the reaction site. The rate of CuAAC reaction depends on concentrations of all reagents, including copper, thus the raise of the effective copper concentration at the reaction site dramatically increase the rate of CuAAC reaction without the need to increase concentration of azide reagent and copper. In addition, the use of IR 650 Picolyl Azide instead of conventional IR 650 Azide allows for at least a tenfold reduction in the concentration of the copper catalyst without sacrificing the efficiency of labeling.